Dollar Dash was relisted on PlayStation 3 in North America no later than November 12th, 2018. This is the earliest date we re-checked its availability and it likely returned before this date. As of this writing it has not returned to Steam. 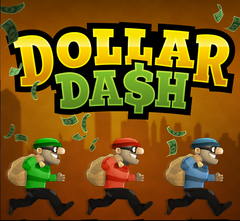 Dollar Dash was delisted on PlayStation 3 and PC in 2015. On Steam it was delisted in July but the exact date is uncertain for PlayStation 3 though it was likely delisted around the same time. The game remains available on Xbox 360 and PlayStation 3 in Europe and Australia. It is also available on PC through Desura and GameStop. It is uncertain why the game was delisted only on Steam and PlayStation 3 in North America. Developer Candygun Games’ social media accounts have been inactive since August of 2013. Two years later (by August 2015) the game was removed from their homepage and the official site — DollarDashGame.com — redirected to publisher Kalypso Media. Though it seems the studio has closed several staff members list themselves as current employees on LinkedIn.